I know what you are going to say. I haven’t been on my best behavior as of late. I will not confirm nor deny that I dragged the trash throughout the house to get the paper towel covered in bacon grease. I will not confirm nor deny that I licked a batch of cookies when a certain person wasn’t looking. I will not confirm or deny that peed at my grandma’s house at Thanksgiving which I have never ever peed inside before ever. I will not confirm nor deny that I lunge at people’s hands in order to catch them off guard and they drop food and I just happen to pick that up for them with my mouth. I will not confirm nor deny that I roll in the clean laundry pile before it is folded. I will not confirm nor deny that I went on a hunger strike because I became a snob over food choices. I will not confirm or deny that I keep scratching up mom’s dining room chairs while begging for food which I know I am not supposed to do. OMG, I totally thought it was *you* writing that letter…until I got to the part about scratching chairs. I was picturing you licking baked goods & jumping at people to get their food & I almost woke everybody else in the house lmao. i like to roll in clean laundry too…especially straight out of the dryer in cold weather. and i may or may not lunge at people on occasion. OMG CCC is the cutest thing ever! I love her and her little confessional to Santa. After seeing that picture, I feel like I should be sending chicken strip treats as well :). My 4 year old said to tell you that you’ve got a pretty cute dog there. I would agree! 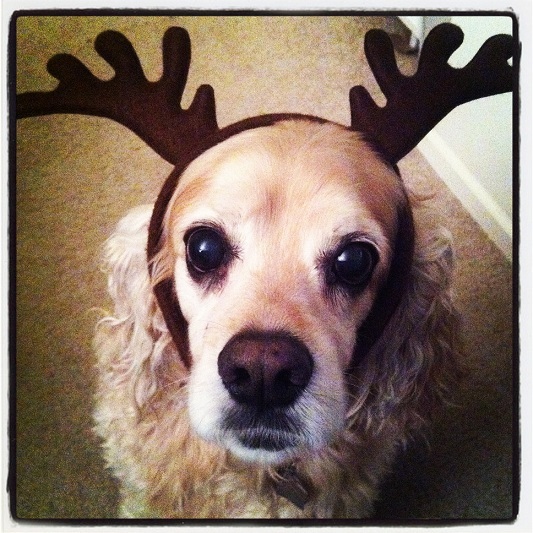 I think CCS deserves treats from Santa just for wearing the reindeer getup. Dear Furbaby, You can have what ever you want. Most puppy-eyed puppy I’ve EVER seen! You must have a very strong will. Like you mom, I’d be sneaking treats to your Furbaby all the time! Toooo cute! I hope Santa brings CCS everything on the list plus more! If I were Santa, I’d give in to those eyes!